Can you believe it, I’ve never seen a Muppets movie/show/special/whathaveyou? I used to watch Muppet Babies, if that counts, though I doubt it does. And I assume you’re judging me a bit right now, but I just never watched the crew, not exactly sure why, it just never happened. I know a little about the characters (who doesn’t), and I’ve listened to some of their songs (who hasn’t), but I’ve never sat down to watch one of their shows. 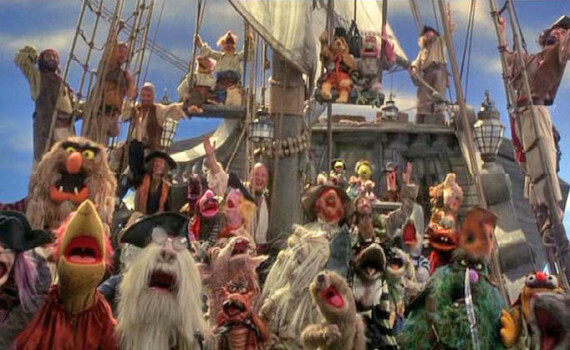 So Muppet Treasure Island would become my first real experience with the Muppets, my family by my side to share in my enjoyment of this classic. And, I’ve got to say, though I doubt it’s a popular opinion, I wasn’t very impressed. Join Jim Hawkins on his well-known voyage to seek out cursed treasure on a faraway island, all the while with the famous Muppets at his side. It all begins with Billy Bones, a guest at the inn where Jim works. Billy knows the location of buried treasure, left by the infamous Captain Flint many years before. Flint’s crew is on Billy’s trail, after the map, and Jim will flee the inn if he values his life. He joins up with a squire, a doctor, and a sea captain, all with their eye on the gold. But there’s one more important character to take into account, the ship’s cook John Silver, a one-legged old sea dog who is much more than he appears. Jim & the Muppets are off on an adventure on the high seas, not knowing what exciting event will occur next. In the vein of the Muppets, this well-known tale is retold with comedy, music, and a ridiculous amount of fury creatures. The plot sticks to the novel fairly well, the Muppets bring the fun, and the humans round off the quirky cast. Tim Curry stole the show as Long John Silver, with the boy who plays Jim Hawkins sticking out like a sore thumb. But it was the Muppets who were the meat of the movie, and, honestly, I didn’t love them. Their songs were too silly, the humor so over-the-top, the action insane, the jokes juvenile, and the target audience unknown. It wasn’t exactly a kids movie, it wasn’t deep enough to draw in skeptical adults, and I assume now that the only people who love this film are those who grew up watching Muppet mania on a daily basis. I think I missed my window, could only barely enjoy what others are so familiar with, and probably won’t be seeking out this motley crew again soon.